Editor’s note: Ziad Haider is director of the Truman National Security Project's Asia Expert Group. He served as a White House Fellow in the U.S. Department of Justice and as a national security aide in the U.S. Senate. You can follow him @Asia_Hand. The views expressed are his own. “Let China sleep; when she awakes, she will shake the world.” Uttered by Napoleon Bonaparte two centuries ago, these words now seem prescient. Yet pitfalls a plenty remain in China’s rise. Chief among these, of course, is the stability and legitimacy of one-party rule. But why has the Chinese leadership turned to another Frenchman, political philosopher Alexis de Tocqueville? Why has his classic work The Old Regime and the Revolution become a best seller in China? And ultimately, what lessons can Beijing learn from the French Revolution? Interest in China in Tocqueville and the revolution can be traced to the upper echelons of China’s highest leadership body, the Politburo’s Standing Committee. Vice Premier Wang Qishan, chairman of the Communist Party’s Central Commission for Discipline Inspection, is responsible for combating corruption in the party – a priority for China’s new leadership to shore up its standing after a string of scandals. Now, Tocqueville is featured in the bookstore of the Communist Party School where China’s leaders are trained, where his 1856 book is reportedly described as “recommended” by Wang Qishan. So what lessons might Chinese officials draw from Tocqueville’s account of the revolution? First, popular perceptions of ruling class excesses must be checked. Such was the view of the Old Regime in France, embodied by a scandal that supposedly involved Marie Antoinette’s participation in a scheme to defraud the crown jewelers over an exorbitant diamond necklace. The scandal seized the public imagination and stoked widespread anger in the lead up to the revolution. More from GPS: How bad is corruption in China? 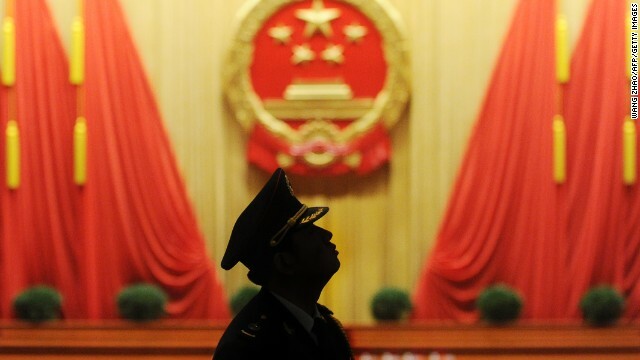 China’s new leadership is aware that many Communist Party officials are viewed as abusing their authority and wasting money. Along with the indictment and trial of former Chongqing Party Secretary Bo Xilai for bribery and abuse of power, curbs have been imposed that have included anything from banning ads touting luxury items “as gifts for leaders,” to reining in spending on official banquets. Second, the monarchy’s frequent intervention in judicial proceedings to protect its officials fueled public disenchantment. Presiding over a meeting of the Political Bureau of the Party’s Central Committee in February, President Xi Jinping addressed a similar theme: the need for all organizations and individual to be subject to the Constitution and the laws. Last year, more than 30,000 party members were punished for accepting bribes or embezzlement, while the overall number punished was up 12.5 percent from the previous year, according to state media. Yet Chinese activists remain unimpressed. How Chinese officials interpret this paradox at the heart of Tocqueville’s analysis of the revolution is the question. Xi’s important anti-corruption and rule of law measures have been accompanied by a crackdown on Chinese anti-corruption activists. The latest target: Xu Zhiyong, a law lecturer who has campaigned for officials to further disclose their personal assets. The regime’s understanding of the need to reform thus coexists with a fear of losing control – a bias Tocqueville seems to confirm. U.S. is also one-party rule. China is communist one-party rule, plain and simple. U.S. is capitalisnt one-party rule, not plain and not simple. Not until the day comes, it become plain and simple, American people realise that U.S. is capitalisnt one-party rule, which is a pitfall as well. Ok, It's time to remove Obama and Biden, plus anyone else who thinks they are the rulers of the world, This is what happens when ignorant American voters put dangerous self serving morons in office! let's say the traditional democracy viewed by Western civilization is actually conflicting with the culture in Chinese political nature. Politics nowadays in China is nothing different than it from two thousands years ago. First, the author is not comparing like with like. Totalitarian as it is the regime is not based on self-indulgence but probably over-obsessed ideology dealing with inequality issue. The majority of the rich and middle class has no reason to turn against it as it was the reason their fate was changed, otherwise they may still be impoverished as their ancestors. Second, while overstating the role of regime in impeding democracy, the author selectively ignore the prominent influence of the anarchist populists in the French Revolution. As a knowledgeable person, he is unlikely to be considered as being immature or naive, but paranoid out of arrogance. do not think chinese as total idiots who can not see that democracy is not anarchist populism instigated by a few marginalized activists.Whatever the kind of change is, it is definitely not deja vu. When a popular uprising results in collectivism, you know that somewhere a mistake was made and a wrong person followed. Did I say popular uprising? I meant political faction backed with Soviet muscle and weaponry. Acquire as many models as monetarily achievable when selecting professional real estate property. If you need to get funding to get a number of units, then you definitely may possibly too find more credit and acquire as much units as you possibly can. The for every unit price lowers once you raise the number you acquire, so preserve a little funds by investing more. If you will be making use of substances inside your backyard garden, dress in a mask and mitts. Purchase a chemical substance resistant couple of safety gloves for your personal hands, as well as a easy cover up to guard your breathing passages. Chemical compounds may be harmful to the epidermis and lung area, it is therefore generally greatest to keep them out. You need to start promoting things about your residence and creating budget slices when you have declared personal bankruptcy. This is the time to start saving cash as well as prevent simply being reckless. You are able to target the future and acquire your financial situation as a way, so that you can have got a encouraging fiscal future for the rest of your daily life. Do you know that it is actually extremely difficult to suffer from depressive disorders and anxiousness when you are joking? Fun is fantastic medicine for preventing anxiousness. There has been a great deal of research on the subject, but it really fails to have a scientist to understand that when you find yourself joking, you are not stressed out.